on the sidewalk these days. But there remains the problem of too few places to sit and eat. 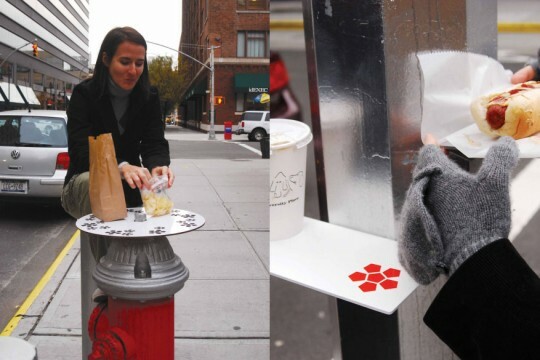 Observing far too many messy standing lunchers, industrial designer Alexandra Pulver came up with Pop Up Lunch, a collection of “mobile eating tools” that plug into ubiquitous urban elements to create instant tables and chairs. Using magnets, hooks, or strategically placed notches, Pulver’s compact, portable interventions make traffic signposts, fire hydrants, even garbage cans into temporary lunch spots. She has even found paint to be an easy accomplice, stenciling a graphic of a Thonet seatback over a water standpipe to highlight its availability as a seat.